Most of all, though, the Hotel Earle (“A day or a lifetime”) is ominously empty. This even though we can see evidence of considerable occupancy right from this introductory scene, both in the hotel register (a far cry from the mostly blank pages at the Bates Motel) and in the harmonious spatial arrangement of key/no-key in the cubbyhole mailboxes behind the desk. Later in the film, we’ll see shoes placed outside every single door, awaiting a complimentary shine. And yet the only four human beings we ever see in the place (apart from visitors) are Barton, Chet!, the decrepit elevator operator, and Goodman as Barton’s next-door neighbor. For me, this extreme overstatement conveys the loneliness of traveling far from home much more powerfully than would a more realistic depiction, or even (to vaguely allude to Serious Man) a lightly exaggerated but essentially believable approach in which, say, just one or two extras wander by. Either set the movie in the real world or don’t; if you don’t, though, why take half measures? It’s when you don’t fully commit that you wind up looking pretentious. Consider also the bell, a terrific aural joke. It’s one thing to let its sound continue well past the point when any vibration would have ceased—I can imagine any number of filmmakers (including the Coens working more around the middle of their game) coming up with that touch. What gets into my skull is the way the sound fades and fades until it’s nearly subliminal, so that on first viewing, you may not even realize it’s still ringing until Chet! shoots Barton a little “Again?” look and stops it with one polish-blackened finger. At the time, I was reminded of the magnificent opening scene of Robert Altman’s Vincent & Theo, made the year before: Altman begins with actual footage of an auction at which one of Van Gogh’s paintings was sold for many millions, then allows the sound of the bids going up and up and up to play, just faintly audibly, over an impassioned dialogue scene depicting Vincent and his brother living in depressing squalor. But I can’t recall encountering that technique again in the nearly two decades since. It’s the kind of striking, inspired detail you never forget. One of the many things I found disappointing about A Serious Man—I’ll try to keep on keepin’ it vague, as I know most of you haven’t yet seen it—is that the film’s supporting characters rarely, if ever, defy expectation. If you’d expect someone to be threatening, he is, from start to finish. 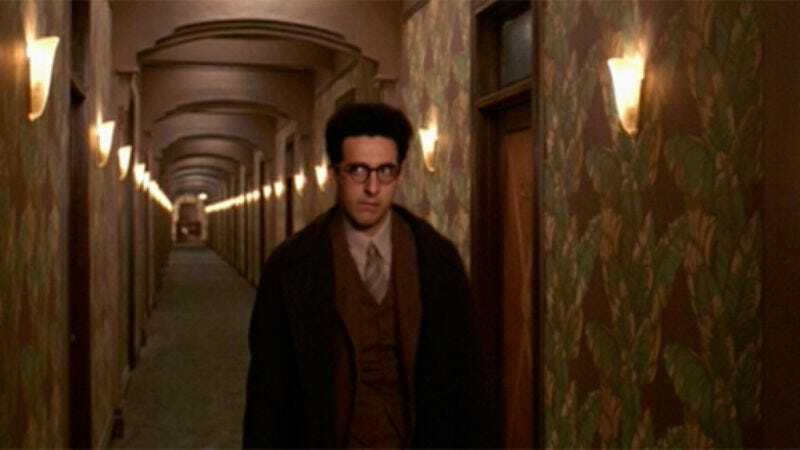 Not so in Barton Fink, which constantly finds inventive ways to keep you off-balance. Chet!, for example, in spite of his unexplained subterranean entrance (and the fact that he looks like Steve Buscemi), couldn’t possibly be more friendly and helpful, and it’s precisely his chipper solicitude—the practiced spiel, the repeated mention of his name (with exclamation point! ), even his pronunciation of “Los Angle-es”—that starts to feel inexplicably creepy. Maybe it’s simply his refusal to acknowledge in any way the weirdness of the situation, which even Norman Bates nervously does. With hindsight, he almost seems like Wall-E, mechanically performing pre-assigned tasks in a world that no longer has any need for him. The more expressionistic aspects of Barton’s room come later in the picture, but the final moments of this scene do provide our first glimpse of the kitschy painting with which Barton becomes transfixed. I don’t have any real desire to tackle the question of what this image, and its live-action recurrence in the film’s final shot, mean, any more than I want to have a tired debate about what’s in the head-sized box (or what’s in the Pulp Fiction briefcase). The answers to such questions don’t ultimately matter, so long as the totemic images provoke a productive sense of uncertainty, getting viewers thinking about why they’re feeling what they’re feeling. What I want to emphasize here is the way Joel and Ethan shove the movie’s symbols right in your face, rather than subtly deploy them in the margins or confine them to dream sequences. Not only does that constitute a sort of respect (in that they aren’t feigning verisimilitude and trying to slip deeper meaning into the audience’s noggins like a mickey at a dive bar), but it allows them to tackle real emotion—in this case, loneliness and longing—without feeling exposed, as they can and inevitably do claim that it was just a giggle to them. It’s when they deliberately step forward that they become cute and evasive. But that’s a different subject altogether.